A young child's foot grows from 2 to 3 sizes per year, and from the age of 5, 1 to 2 sizes per year. Since the bones of a child are still flexible, it feels little pain if shoes are too small. That is why we must be vigilant and regularly review the shoes worn by our children. The foot of a child must be supported by it's shoes, but not too tight. Shoes have the right size if you're able to insert one finger between the heel of your child and the shoe. This takes into account growth and boost movement (the flexing forward motion of the foot in contact with the ground). · Take sizes at the end of the day, when feet are wider. · For measuring your child should wear the same socks it will be wearing with the new shoes. · Measure both feet and use the size of the larger foot. · Measure your child's feet standing, the result will be better. · You can take measurements in inches or centimeters. To convert inches to centimeters, multiply inches by 2.54. · Put a sheet of paper on a flat and rigid surface. · Ask your child to come stand on the sheet. · With a pen, trace the contour of the feet on the sheet. Keep the pen in an upright position when you do the outline, so it constantly keeps contact with the feet. 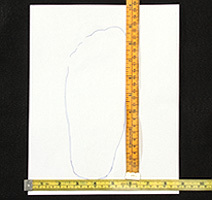 · With a ruler, measure your trace to determine the length and width of the foot. To find the length of the feet, measure the distance between the two farthest points. The result will be the length of the foot, and you can use this number to determine the size. Note: If you are between 2 measurements, it is recommended to take the greater size.